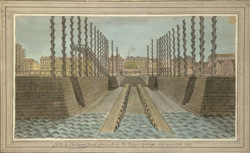 View of the slip in Chatham Yard from which the Royal George was launched in 1789. The first ship known to be built at Chatham was launched in 1585. According to Philiport in 1659 there were ' Arsenals, storehouses and ship-docks erected here by the late King Charles'. In the early eighteenth century a completely new series of administrative buildings, storehouses were built. Daniel Defoe in 1720 commented approvingly 'The buildings here are indeed like the ships themselves, surprisingly large, and in the several kinds beautiful....the largest in dimension and the most in number that are anywhere to be seen in the world'.